There is hope! In a place like Israel, there are beautiful people like Rabbi Arik K. Ascherman, who wakes up at dawn to protect the Palestinian farmers working in their Olive tree plantation in their own lands. For the indigenous poor people of Palestine, one of the most important income source is Olive Tree plantation (60 percent of Palestinian crops). Radical Jewish Settlers (who are mostly living illegally on lands belonging to Palestinian people) very often cut down or burn the ancient olive trees which belongs to the Palestinians, which are perhaps the only source of income for the poor familes. Not only that, they shoot, injure and even kill farmers who dare to come to their own land. 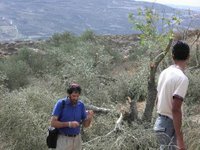 Rabbi Ascherman, who is the co-director of Rabbis for Human Rights, spend the olive season rising at dawn with other israeli volunteers to put their life on the line to protect Palestinian farmers from armed Jewish settlers. Without the Jewish cleric, the poor and helpless palestinian farmers would be fired upon or beaten, their harvest stolen and ancient trees - some are dating from Roman times, felled with chainsaws. 'Viewers of CNN news probably are familiar with Rabbi Arik Ascherman, the tall, thin bearded man who places himself before Israeli bulldozers on their way to demolish Palestinian homes or olive groves. There he stands—until Israeli soldiers drag him away. The American-born, Harvard-educated idealist explains that he had an epiphany during the sixth and seventh months of the current intifada. It was then that he graduated from protesting the war against civilians to performing acts of resistance, such as defying bulldozers and trying to refill ditches blockading Palestinian villages.' ... read more from Washington Report, which writes: If All Rabbis Were Like Arik Ascherman, Middle East Peace Would Be Attainable. When you besiege a city for a long time… you must not destroy its trees, wielding an ax against them (Deuteronomy 20:19). There shall be one law for the citizen and the stranger who dwells amongst you (Exodus 12:39). The Postscript reads: As I write these lines, 140 trees were cut down in the Palestinian village of Burin. Also read details about Rabbi leads defence of Palestinian olive groves from TimesOnline. 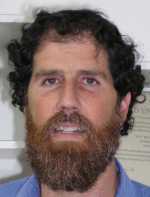 May God bless the people like Rabbi Arik Ascherman and other from Rabbis for Human Rights for their good work.